Calculating the cost of leaving invoice finance depends upon the type of facility that you have, and the nature of the agreement that you have entered into. There are various aspects to calculating the overall cost. Firstly, there may be a termination fee. Secondly there may be additional costs that you will incur by having to undertake certain tasks yourself, that were previously undertaken by your invoice finance company. The circumstances of the termination may also have an impact. For example, if the invoice finance company is terminating your facility, and collecting in their outstanding funds from your sales ledger, they may levy a charge in respect of this activity. This could be in addition to termination fees and/or invoking minimum fees. Any termination fees should be set out in the agreement that you have entered into. You should read this carefully and seek legal advice if necessary. Legal agreements can range significantly. In the case of selective invoice finance agreements, it is common practice not to require any payment if the customer no longer wishes to use the facility. The customer simply stops sending invoices. The facility can even be retained in the background, to be reactivated should you need it in the future, in some cases. However, not all invoice finance facilities operate in the same way. Most full turnover arrangements will have some form of termination fee built-in. This may take the form of a minimum term for the arrangement, coupled with a minimum fee. The two may work in conjunction to arrive at a termination fee. In other examples, there may be a specified fee for termination of the arrangement. This may operate on a stand-alone basis or in addition to invoking some form of minimum fees. As mentioned above, if termination of the arrangement involves collecting out the sales ledger, it is often the case that a percentage of the value of collected debts will be charged as a termination fee. Although this does not apply in all cases. If you are considering leaving your invoice finance arrangement, you should read our free guide to getting out of factoring in order to understand the alternative options to using factoring, that may be available. If you are considering moving from one invoice finance company to another, there may be some options regarding any termination fees that all costs that may be involved. This can include fees being waived or the new financier contributing towards the cost of terminating your existing facility. It is also often the case that the cost savings of moving to an alternative provider may be significant enough to quickly outweigh any charges. You should be aware that if your provider is a member of UK Finance, the industry body for asset based finance, formerly known as the ABFA, they have a strict code of conduct that includes charging of termination fees. Customers cannot be charged for loss of earnings over and above any minimum fees that would have been charged for the remaining term of the agreement. 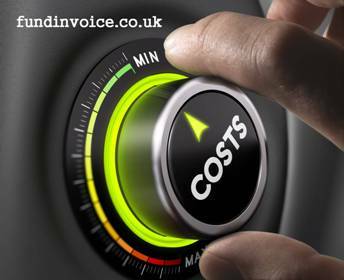 The other aspect of the cost of termination, that is often overlooked, is the cost of undertaking the various services that may have been provided by the factoring or invoice discounting company. These services could include the credit control function within a factoring arrangement. This may need to be replaced by establishing an in-house credit control function. Alternatively, there could be other services such as payroll support that may need to be sourced elsewhere, or services such as bad debt protection which could require replacement via a credit insurance policy - if you wanted to maintain the same level of protective cover. The other substantial impact to the business, in terminating an invoice finance arrangement, is the effect on cash flow. If you no longer have access to funds against invoices as you raise them, made available through an invoice discounting or factoring arrangement, you may need to replace this working capital from an alternative source. This could invoke further fees, or leave you short of working capital. There are plenty of options available, such as business loans that may help bridge this funding gap. You may be interested to read our fact sheet about common complaints about invoice finance, before you decide to terminate your facility. There may be options available to you. If you would like to speak to someone for some free advice about the alternatives that may be available, please call Sean on 03330 113622 and he will be pleased to assist you in understanding your options and alternatives.